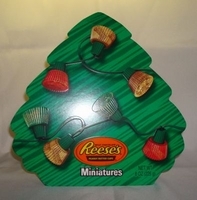 Reese's Miniature Peanut Butter Cups - Christmas Tree Shaped Box. The perfect Christmas gift for anyone who loves Reese's candy. You get a Christmas tree shaped box filled with Reese's miniature peanut butter cups. Each peanut butter cup is wrapped in holiday colored foil. With these cute gift boxes there is no gift wrapping needed. On the back of the box there is already a gift tag all you have to do is fill in the names and you are done. Each box has approx. 25 mini Reese's peanut butter cups.